Fantasy is an additional feature we offer for all tournaments. It allows fans of your tournament to draft a team of 12 players and earn points based on the performance of those 12 players in a specific event at your tournament. No matter how large or small your event is, fantasy is a great way to keep attendees and spectators engaged and entertained! 5. Add 12 players to your roster that have equivalent value to your total budget (in this example, the budget is set to $1400). 6a. Answer the four Bonus Questions. Correct answers to the bonus questions will result in extra points for your fantasy team. There are four default questions, but if you (the TO) wish to change existing or add additional questions, let us know when you request Fantasy for your event. 6b. 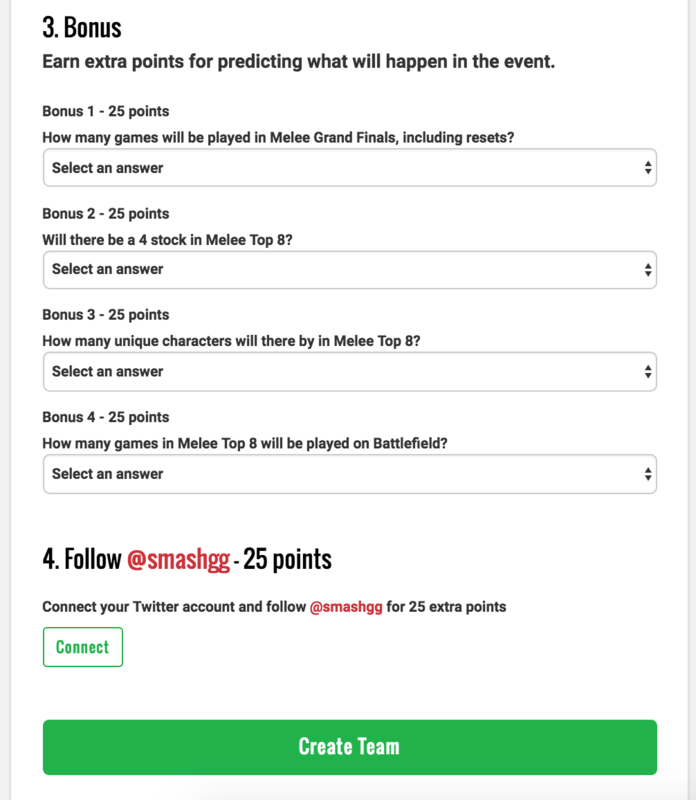 Follow @smashgg on Twitter for an additional 25 points (not required). 7. Once you have completed the above steps, you can select Create Team and finish the process. You now have a fantasy team for the event. Fantasy has seen high profile use on our site among larger events such as EVO, Genesis, and The Big House, but it is often not taken advantage of for smaller events. Attendees become more involved and discuss your tournament in the time leading up to it. This generates more local attention for your event. Increased spectator engagement at the event. Attendees spectate and discuss more matches. Attendees stay longer at the event to see results. Many people who would otherwise leave normally stay to watch their best players compete. You can also offer prizes for attendees who do well in Fantasy! Prizes will be displayed on the Fantasy tab of your tournament. However, prizes are not a requirement to run Fantasy. 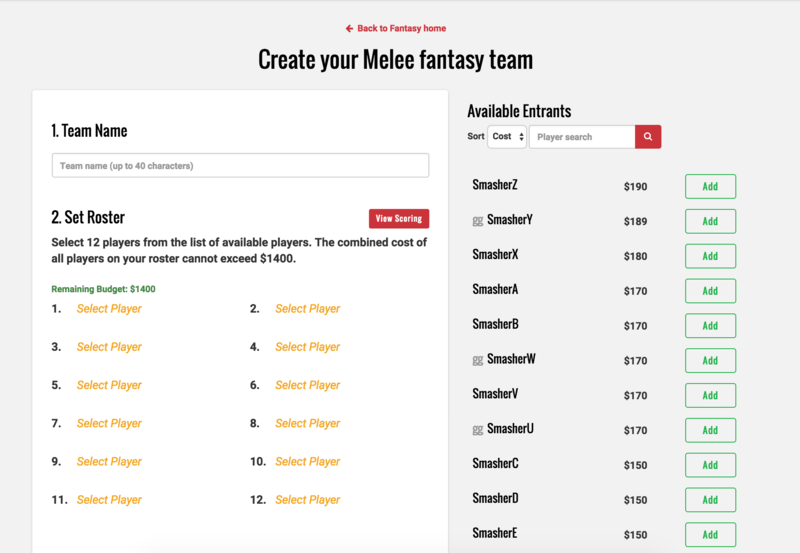 Interested in enabling Fantasy for your tournament? Once registration for your tournament is has ended (or is close to ending), contact smash.gg via email at hello@smash.gg to request Fantasy, OR send us a message via Intercom. During your event, report game data (characters, maps/stages, etc.) for top 8 matches. This is used to score the bonus questions.